STG Training – Week 5: Where Did That Come From? Yesterday I couldn’t get myself out of bed in time to get in my run before work so I ended up having to squeeze it in between work and mid-week Bible study. It was fairly hot, but the humidity was down just a bit. My schedule called for 6-miles at “easy” pace, so I decided to start from my house and do a 6-mile route through the streets of Bellevue. When I went to grab my Garmin I saw that the battery was dead, so I just took my basic Timex stopwatch instead. I knew from the start that my legs felt good, but I really didn’t know what pace I was running without my GPS. The heat was pretty intense, but I maintained a steady pace and my legs felt good throughout the run. When I got back to the house my stopwatch read 48 minutes, 46.16 seconds. I used MapMyRun.com to confirm that my route was actually 6-miles, and it came out to 6.05. 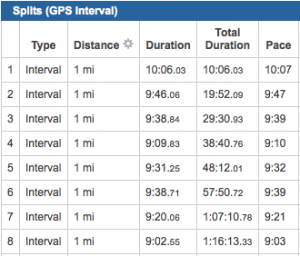 This translates to a pace of 8:04 per mile, which is quite a bit faster than my “easy” pace target of 9:05 to 8:26. This is actually even faster than my “long” run pace range of 8:05 to 8:25. Not sure where this burst came from, but it was actually a big confidence boost after many slower runs in recent days. On Thursday I met the JSRC track group at 6pm at Vanderbilt to complete my weekly “speed” workout. 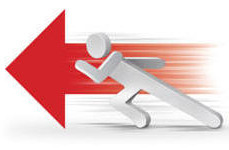 I did the week 3 “speed” workout prescribed in the Hansons Advanced Training Plan. This was 6 x 800m with 400m recovery in-between each interval. This equates to 3-miles of intervals and 1.5-miles of recovery. Based on my goal marathon time of 3:15, the target splits for this workout are 3:15. While, this is the goal, the Hanson brothers really emphasize not exceeding your target pace, and even make their athletes do sets of push-ups for every second they exceed their goal. Since I have a day-trip to Ft. Lauderdale tomorrow for a speaking engagement, I needed to move a few things on my schedule around this week. This meant that I got to do a solo track workout this morning at the Hading Academy track. Even though I despise doing track work by myself, this workout actually went really well. 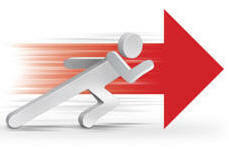 I did the week 2 “speed” workout prescribed in the Hansons Advanced Training Plan. This was 8 x 600m with 400m recovery in-between each interval. This equates to 3-miles of intervals and 2-miles of recovery. Based on my goal marathon time of 3:15, the target splits for this workout are 2:26. While, this is the goal, the Hanson brothers really emphasize not exceeding your target pace, and even make their athletes do sets of push-ups for every second they exceed their goal. STG Training – Week 2: 6 Consecutive Days Running and Today Was the Best! Today marked my 6th consecutive day to get in a training run, and I can’t remember the last time that has happened. I’m guessing it has been well over a year, if not much longer. Many of these runs have been fairly crummy (Sat, Sun, & Mon specifically), but tonight’s “speed” workout was BY FAR the best I’ve felt during those 6-days. I met my normal track group tonight at Vanderbilt, but instead of joining their workout I did the week 1 “speed” workout prescribed in the Hansons Advanced Training Plan. This was 12 x 400m with 400m recovery in-between each interval. This equates to 3-miles of intervals and 3-miles of recovery. Based on my goal marathon time of 3:15, the target splits for this workout are 1:38. While, this is the goal, the Hanson brothers really emphasize not exceeding your target pace, and even make their athletes do sets of push-ups for every second they exceed their goal. Tonight was my first track workout in over a month, and it was good to be back running with the Jim Spivey Running Club (JSRC). I intentionally shifted the Hansons Advanced Marathon training plan a bit so that the “speed” workouts would fall on Thursday instead of Tuesday. This way I can continue to run with the JSRC during the “speed” phase of the plan. Thick humidity has descended on Middle Tennessee with a vengeance this week, and tonight was tough with temps around 85º. 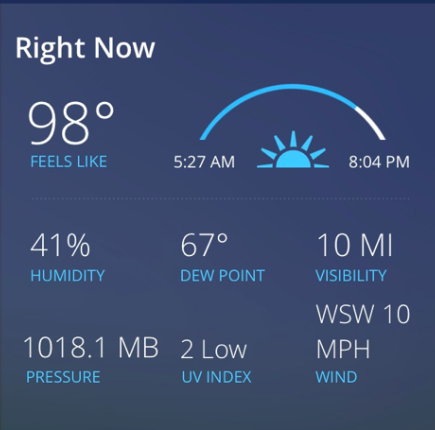 I know it is only going to get worse, but my body struggling to get acclimated right now. As usual for Thursday, tonights run was a track workout with the JSRC. I have been feeling crummy the past two days, so I almost didn’t go. However I knew I would regret it if I bailed. I felt fairly louse through the 200s, but started to find a groove during the last 3 intervals. All-in-all I’m definitely glad I didn’t bail on track tonight. After getting home I did a half-set of P90X Arms and Shoulders. Of all the P90X workouts, this one is where the after-effects of the brachial neuritis in my left shoulder rear their ugly head. I can be lifting a 30-lb dumbbell in my left arm with no issue, and then with the slightest turn it’s like I’ve got nothing at all. There was one particular shoulder workout where I could easily use a 30-lbs dumbbell with my right-arm, but could barely lift 5-lbs with my left. Anyway, I got through the workout, and should be better prepared for how to approach it again next week. This is the group that showed up for tonight’s track workout with a wind chill of 10°, light snow, and 20+ mph wind. 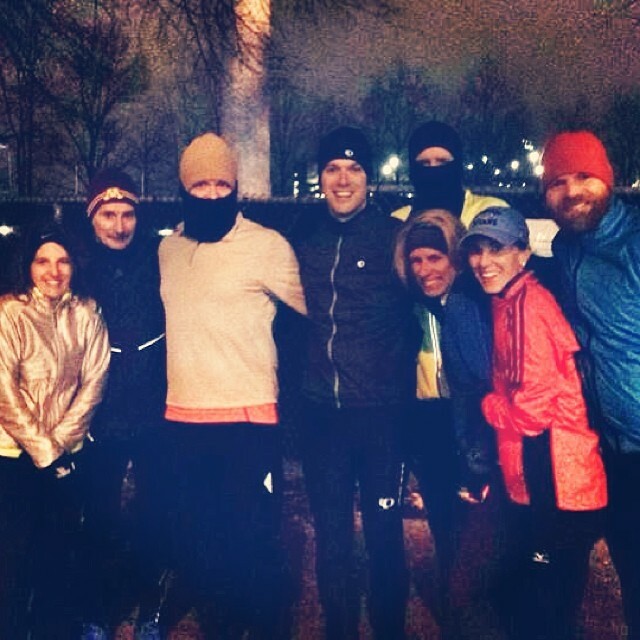 The track ended up having a layer of ice on the back straightaway so instead we went on an enjoyable group run through the Vanderbilt campus. 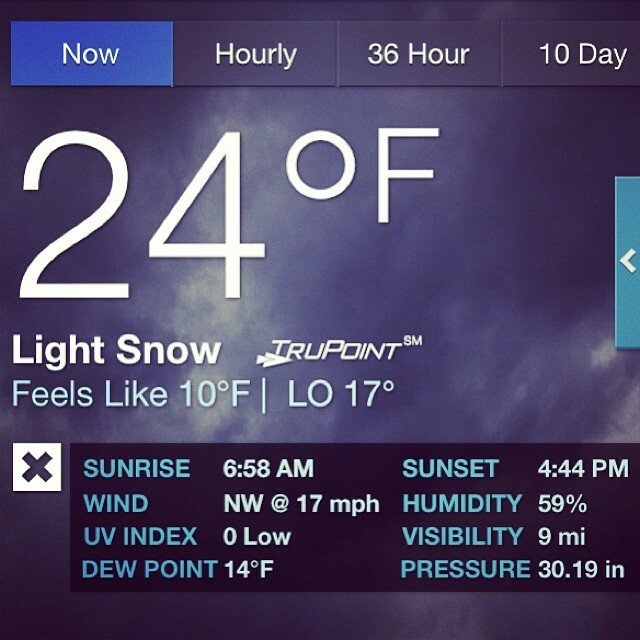 I would pick a night when the “Feels Like” temperature is 10° to make my return to track with the JSRC. What am I thinking?? Thursday is normally track night with the JSRC, but tonight is also “Meet the Teacher” night at Kate’s school. Because of this, John sent me a substitute workout that I could run this morning. This is a bit more intense than a normal track workout, but I’m guessing this is more in line with what John would draw up for marathon training if I didn’t normally go to JSRC workouts. Would love to know your thoughts on this John. Anyway, to be honest I had a bit of trepidation about this morning after my so-so tempo workout on Tuesday, and experiencing hip and quad tightness yesterday. We got a bit of a break in the temps today, and this provided a very welcome boost. It was still fairly humid, but 64º felt nice. Nathan and I met at the Bellevue United Methodist Church parking lot, and ran our 10-minute warmup out to the new section of the Harpeth River Greenway. Up to this point we had only done easy runs on this greenway, so it was nice this morning to break it in a little. For the workout we went 5-minutes out, did our 30-second recovery, and then did 5-minutes back. The reason for this is a mystery to me. There does not appear to be a significant difference in elevation change between the two directions, and there was almost no wind to speak of. I’m guessing it was either a mental thing, or both of our Garmin watches just liked coming back better and showed a faster average. No idea. Regardless, I felt much, much better today that I feared I would. It was a hard workout, but my legs felt strong, and the pace was not overwhelming. Also, unlike Tuesday, Nathan and I ran together the whole way, which was nice. Even though the intervals were 5-minutes each, it turned out to be almost exactly an 8 x 1200m workout. All of our segments were between .74 and .76 miles completed. Once we finished the repeats, we ran our 10-minute cool down back to the cars at a very chill pace. In total we finished just over 8.5-miles with warmup and cool down at an average pace of 7:32 per mile. After missing last week’s JSRC track workout because of my business trip to NYC, it was good to be back with the group tonight. We continued to have a slight break in the weather with temperatures around 86º at the start. However, even with the cooler temps the humidity was still pretty intense. All through the warmup and strides I had a little twinge that ran all the way down my right leg and into my foot. It didn’t feel like a muscle strain or anything like that, but more like a nerve twinge caused by a tight hamstring. Whatever the case, it didn’t affect my stride, but just felt strange. Thankfully, once we got into the meat of the workout I didn’t notice it at all. All short intervals tonight, but I felt fantastic throughout the repeats. I ended up running the entire workout with Sue Anne, and it was really nice to have someone to run with tonight. Our consistency was a little wobbly during the first two sets, but we got dialed in during the third and fourth. In total with warmup and cool down I finished just over 8-miles with an average pace of 7:59 per mile. One neat thing tonight was that Olivia, Kate, and Sara came out to meet me near the end of the workout. I got to run one cool down lap with Sara and another with Kate. Pretty Cool!